HAVE you ever read a book that took you on an emotional roller coaster? Tears, laughter, admiration, anger all at once? After reading Dear John by Nicholas Sparks this is what many readers and I had experienced. It is a beautiful yet tragic story of love, a tribute to the armed forces, autism and many sacrifices. This novel unlike some other fiction novels teaches us real life lessons--to love and to forgive. Nicholas Sparks is an American author, who is known as the world's most beloved storytellers. Dear John was published in year 2006 and made into a film that was released in 2010. All the main characters, John Tyree, Savannah Lynn Curtis, and Tim Wheddon were portrayed beautifully and their nobility towards each other left me humble. Dear John besides being a romance genre novel serves many other purposes. To begin with, it is a tribute to the armed forces and an honor for all those who risk their lives for their country. It also portrays a beautiful father and son relationship, between John and his father. Tim is a gentle and patient man, who never once complained in raising his brother Alan who is autistic. Savannah studies special education, and dreams of setting up her own school for autistic people. The book begins in Lenoir 2006 as John waits patiently behind the bushes for Savannah to appear and when he sees her, he drifts five years back and recalls how it all started. John was an angry rebel, who grew up without a mother, and a socially awkward father who only took interest in his collection of coins. John's father never complained that his entire life was spent raising a son like John who was pretty hard to deal with sometimes. To take his life in the right direction, John joins the armed forces. On his two-week leave in North Carolina, he meets a young, sophisticated student Savannah who is volunteering for humanity service and building homes for families whose homes were destroyed in a hurricane. In the two weeks that they spend together, they fall in love and promise to get married once John returns. 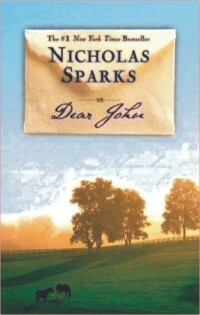 In the years apart, John and Savannah send letters to each other, and John finds himself living only for those letters. However, the course of the incident of 9/11 and the fall of the World Trade Center changes their lives as John leaves for the war in Iraq with Savannah ending it with a final letter. John returns from war to spend time with his estranged father, who had suffered a heart attack. John and his father were never close, but they reconcile shortly before his death. Later, John visits Savannah and finds her married to Tim, who is time diagnosed with cancer. Savannah has changed, as the once very religious girl who never smoked or drank, has fallen in the habit of drinking. When John visits Tim in the hospital bed, he apologises and that wishes them all the happiness. He informs John that Savannah still loves him. He makes John promise to be there for Savannah. John, knowing that Tim's treatment was not possible because of the financial crisis they are going through, sells his father's prized coin collection bearing in mind that to no other person will these coins mean so much as they had once meant to his father. It is the year 2006, in Lenoir that John is in front of Savannah's house waiting, as he sees Savannah, Alan and Tim back home. He already knows that Tim is cured temporarily. It is the night of the full moon, like it was when John and Savannah met for the first time. In one of the letters, Savannah made him promise that no matter where they were, and no matter what was going on in their lives, they will always look up at the moon and reminisce all that they had shared and even if they were not in each other's lives, maybe this way they can make it last forever. Dear John is a special memoir to many, as it serves an importance for the families who are involved in the armed forces, and also to all the victims whose lives were forever changed in the incident of 9/11. Sparks ends the novel by giving the readers hope that John and Savannah will come together someday, especially after all the obstacles and sacrifices they've been through. I will always admire the noble characters of John Tyree, Savannah Lynn Curtis and Tim Wheddon. It is a book that I will remember for a long time.